It wasn't just that Bruce Lee was a natural fighter. They counted how many different styles he knew and they reached something like 52 before they stopped counting. That is why his Jeet Kune Do never progressed any further than his book. He developed a style that is so advanced and simple that no martial artist has ever been able to understand it properly. Very few people have ever learned as many styles as he has. His Jeet Kune Do was written with the purpose of knowing lots of martial artists and then washing out the mess to make a finite style. And people who say "Yeah, I'm learning Jeet Kune Do." You are probably being taught a couple of the animal styles from different kung fu's etc. and somebody is training you who claims it's Jeet Kune Do. It is literally impossible to completely understand without being at Bruce Lee's level and knowing the amount of styles he knew. It's like Beethoven coming up with the 9th symphony and every musician since saying, "Yeah, I understand what he means." Just not possible. They don't make them like they used to. Don't forget Bruce Lee in Longstreet! Valuable classic! We get to see Bruce Lee actually teach some esoteric stuff to Longstreet (James Franciscus), who plays a blind insurance investigator. After Bruce's character handily thrashes multiple attackers and saves Longstreet's life, he wisely asks Bruce to help him overcome his disability. Some wonderful teaching scenes; something Bruce tried to incorporate into almost all his films, directly or indirectly. In the early 70s when I was training and competing, I'd watch his movies in Beta-Max, in SLO-MO to absorb the moves and then analyze the tactics/strategy behind the moves. 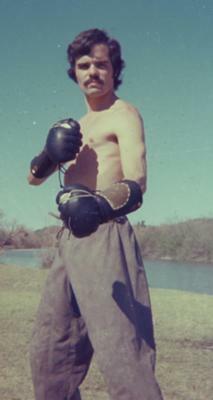 This type of drill allowed me to, e.g., develop a super explosive backfist (a move with which he dropped Bob Wall twice in a row in "Enter the Dragon" BTW, I still have those leather gloves, identical to those which Bruce wore in the opening fight sequence of "Enter" at the Shaolin Temple. Glad to see y'all developing this site. When I have time I'll add some recollections of my experience with some of the legends of MA, even before Bruce launched into the pantheon of legend: the Michelangelo of Martial Arts! Comment by Rob: You're completely right! his movies are excellent because the style of fighting was unique and still i believe that no one can copy this kind of fighting style. unfortunately he died in july 1973, i still believe that he was the master of all the fighting & he was greatest ever fighter in the history of fighting. i think if he alive at this time so he is the only most famous person all over the world. but still he alive in my mind & dream.